Viget Boulder is located in downtown Boulder right off of Pearl Street. Our venue is great for meetings, trainings, meetups, and other events. Parking is available at on-street metered spots along Walnut, or at paid city parking decks at Walnut and 11th or Walnut and 14th (at the RTD transit center). 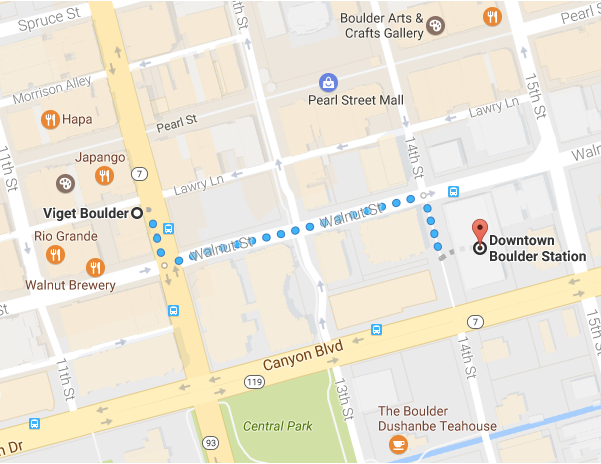 The Boulder Transit Center is a 4 minute walk from the Viget office. If you're interested in a different setup, just ask! We have a single occupancy unisex bathroom on the ground floor and men's and women's restroom downstairs. To book an event at Viget Boulder, please contact khanh.stenberg@viget.com.